Read about how to save gas while road tripping through Texas. How to save gas and stay cool this summer. 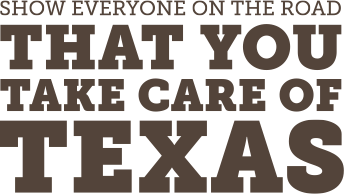 Help your workforce reduce traffic congestion, mitigate air pollution, and relieve stress while they Take Care of Texas. Help your tires last as long as possible and then dispose of them responsibly. Check out this post for fun and easy ways that young people can make a difference! Packing your lunch to take with you to work or school saves gas, reduces emissions, and prevents waste. Doing a lot of driving during the holidays? Use these tips to save gas and decrease emissions.